As the vague threat of “hacking” continues to loom large over our everyday lives, cyber security has traditionally been treated with a level of squeamishness. 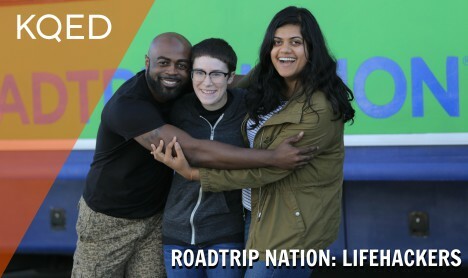 However, as Roadtrip Nation: Life Hackers explores the cyber security industry, it succeeds in driving out some of the dark uncertainties of the field by showcasing the warmth and wit of the students and professionals contributing to its progress. The film follows three young adult “road-trippers” interested in cyber security as they take a journey across the country to learn more about the field. 32-year-old Antwan King is working on a master’s degree in digital forensics and cyber investigation, a field he’s visibly passionate about throughout the film. But in the meantime, he’s paying for college by working a full-time IT job during the day and loading mail trucks at night…and he’s unable to shake the feeling that he’ll be stuck in a cycle of bad jobs forever. It’s a feeling 26-year-old Emily Cox knows well—she’s been working as a barista for years, but her true passion is penetration testing. Despite her strong interest, Emily worries that her lack of formal education in the field will keep her from ever getting her foot in the door. For 24-year-old Mansi Thakar, her own educational path had been pointing her towards a career in chemistry—until her mother called in a panic, saying that her email account had been hacked. Thakar’s initial concern evolved into curiosity, and she’s now enrolled in a master’s program in cybersecurity operations and leadership. The team’s shared journey takes them from coast to coast in a Roadtrip Nation green RV, with stops in Austin, San Francisco, and Seattle, featuring interviews with cybersecurity leaders from IBM’s Charles Henderson—whose superhero-sounding “X-Force Red” team has helped some of the largest Fortune 500 companies in the world find and fix security vulnerabilities—to Cylance’s Stuart McClure, one of the first people to successfully utilize artificial intelligence in the fight against cyber threats. Life Hackers can’t assure its audiences that everything will turn out okay; no cyber security expert can do that. “It’s a very new field, and there’s still so much that we don’t know,” admits Thakar. But the documentary does instill optimism, showing that the future of our online safety will be entrusted to passionate, intelligent individuals like the subjects of this film—currently the closest thing we have to real-life superheroes. Antwan King, 32, gets stressed out by the thought of competing with younger college grads for jobs in cyber security. But he’s worked too hard to get here — holding down a full-time job during the day and at night just so he can finish his master’s degree in digital forensics and cyber investigation. “I refuse to give up,” he says. Emily Cox, 26, loves cybersecurity’s duality: the tools you use to break into a system are the same ones you use to protect it. Quick to get bored, with insatiable curiosity, Emily discovered cyber security a year ago and found a home in the fast-moving, constantly evolving field. Formal education was a struggle and it seems like everyone else started coding as a kid, so Emily wonders if she’ll be able to catch up. Mansi Thakar, 24, thinks cyber security is a field where you can be a superhero. But when you’re a modern-day tech protector facing millions of malware threats, you need backup. That’s why she’s drawn to the place where cyber security meets machine learning. Mansi wants to help shape how we meet the growing magnitude of cyber threats through data and automation.